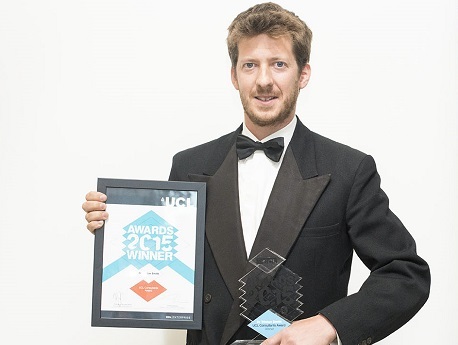 Dr Tristan Smith from UCL's Energy Institute has been awarded the Enterprise Award for Consultancy by UCL Consultants. Over the last 5 years Dr Smith and his colleagues have undertaken a variety of applied research and consultancy contracts from a number of stakeholders in the maritime industry. The projects range from policy analysis to scenario modelling and technical support. All the projects have been associated in some way to the energy efficiency and emissions from international shipping – the focus of the group’s research and mission. One of the largest contracts came from the UN-designated agency for regulating international shipping, the International Maritime Organisation, which involved leading a consortium of ten organisations to produce the Third IMO Greenhouse Gas Study 2014: a major publication for the industry, which will be used as a reference for CO2 emission regulatory discussions for the next five years. Dr. Smith's award follows the recent launch of University Maritime Advisory Services (UMAS), which is a sector focused, commercial advisory service that draws upon the world leading research of the UCL shipping group combined with the advisory and management system expertise of MATRANS Ltd. UMAS brings unparalleled sector knowledge on the subject of energy and shipping, with over 50 years collective experience, making it the largest university based consultancy on GHG and energy matters related to shipping. The UCL Energy Institutes offers its congratulations to Tristan and colleagues.